This Humanities NOW event begins with a screening of of Cooked: Survival by Zip Code by Sundance-award winning filmmaker Judith Helfand on the 1995 Chicago heat wave and how we think of disaster preparedness. The screening will take place at 5:30 PM and will be followed by light refreshments at the Discovery Building. Heat waves. Polar vortexes. Unprecedented storms. Extreme weather is now a common topic of conversation in the street, on social media, in the news, and among policymakers. How is a changing climate impacting our communities as it alters life on Earth? 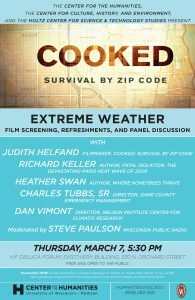 Join us for a screening of Cooked: Survival by Zip Code, by Peabody-award winning filmmaker, Judith Helfand, and a post-screening discussion, led by WPR host Steve Paulson, with a panel of UW experts as we explore living in an uncertain climate future. This event is co-sponsored by the Center for Culture, History, and Environment at the Nelson Institute for Environmental Studies and the Robert F. and Jean E. Holtz Center for Science & Technology Studies. For more information, contact eclark2@wisc.edu or visit the event website.